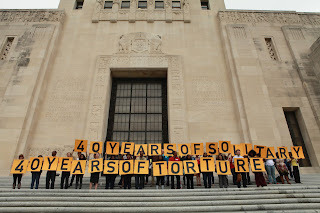 As reported by Mother Jones, "Torturous Milestone: 40 Years in Solitary: Constitutional claim may be the last chance for aging Angola 3 inmates, by James Ridgeway and Jean Casella, on 17 April 2012 --On the world stage, Guantanamo may well stand as the epitome of American human rights abuses. But when it comes to torture on US soil, that grim distinction is held by two aging African American men. As of today, Herman Wallace and Albert Woodfox have spent 40 years in near-continuous solitary confinement in the bowels of the Louisiana prison system. Most of those years were spent at the notorious Angola Prison, which is why Wallace and Woodfox are still known as members of the Angola 3. The third man, Robert King, was released in 2001; his conviction was overturned after he'd spent 29 years in solitary. Wallace and Woodfox were first thrown into the hole on April 17, 1972, following the killing of Brent Miller, a young prison guard. 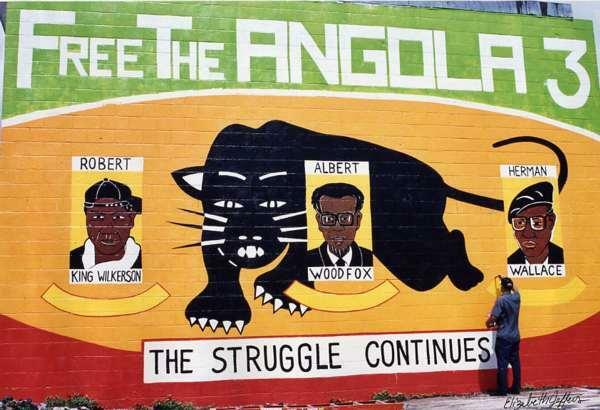 The men contend that they were targeted by prison authorities and convicted of murder not based on the actual evidence—which was dubious at best—but because they were members of the Black Panther Party's prison chapter, which was organizing against horrendous conditions at Angola. This political affiliation, they say, also accounted for their seemingly permanent stay in solitary. For four decades, the men have spent at least 23 hours a day in cells measuring 6 feet by 9 feet. These days, they are allowed out one hour a day to take a shower or a stroll along the cellblock. Three days a week, they may use that hour to exercise alone in a fenced yard. Wallace is now 70; Woodfox is 65. Their lawyers argue that both have endured physical injury and "severe mental anguish and other psychological damage" from living most of their adult lives in lockdown. According to medical reports submitted to the court, the men suffer from arthritis, hypertension, and kidney failure, as well as memory impairment, insomnia, claustrophobia, anxiety, and depression. Even the psychologist brought in by the state confirmed these findings. Over the past decade, as news of their situation spread, the Angola 3 have become an international cause célèbre. They have thousands of supporters, and their case has been taken up by several major human rights and civil liberties organizations, including Amnesty International, which intends today to deliver a 65,000-signature petition to Louisiana Gov. Bobby Jindal, demanding that Wallace and Woodfox be released from solitary into the general prison population. In each man's case, a federal judge has supported the claim that they did not receive fair trials. And although the state successfully appealed these decisions, the men are not through fighting to overturn their convictions. Meanwhile, a team of distinguished lawyers is pushing forward on a lawsuit claiming the men have been subjected to cruel and unusual punishment, in violation of the Constitution. In 2009, a US magistrate judge allowed the suit to proceed. A few years earlier, the same judge had noted that Wallace and Woodfox had been isolated for "durations so far beyond the pale that this court has not found anything even remotely comparable in the annals of American jurisprudence." The civil suit also claims First Amendment violations, based on the contention that the men are being held in solitary for their political beliefs. By all accounts, it represents the pair's only hope of making it out of solitary alive. Elderly and frail, with decades of essentially clean disciplinary records, it's hard to imagine that Wallace and Woodfox could present any threat to prison safety. But they may present a threat to the reputations of two men who are powerful fixtures in Louisiana politics. Herman Wallace, the terminally ill man released just days ago from prison, after 42 years in solitary confinement for a racially charged Louisiana murder case, was re-indicted Thursday by a county prosecutor. A federal judge overturned Herman Wallace’s conviction for murder after a trial based solely on the testimony of four inmate witnesses, one of whom was legally blind, and another a known prison snitch who was rewarded for his testimony. Burl Cain, the warden of the Louisiana State Penitentiary at Angola—profiled here—holds power over the lives of more than 5,100 men living at the notorious plantation prison, which occupies a piece of land the size of Manhattan. Widely celebrated in Christian evangelical circles for having brought thousands of incarcerated sinners to Jesus, Cain has stated that he believes the only true path to rehabilitation is Christian redemption. Those who follow his lead and become born again see their freedoms and opportunities expand at Angola, while those who defy him are dealt with harshly. In a 2008 deposition, attorneys for Woodfox asked Cain, "Let's just for the sake of argument assume, if you can, that he is not guilty of the murder of Brent Miller." Cain responded, "Okay, I would still keep him in CCR [solitary]…I still know that he is still trying to practice Black Pantherism, and I still would not want him walking around my prison because he would organize the young new inmates. I would have me all kind of problems, more than I could stand, and I would have the blacks chasing after them…He has to stay in a cell while he's at Angola." Q: How about this, "We want full employment for our people"? Q: No problem with that? Q: "We want end to the robbery by the capitalists of our black community"…Is that militant in your eyes? A: Because the capitalists are divisive in the country. It's too general, capitalists don't go rob a group of people. A: When he said "our people" he's talking about black people, so they robbed everybody, me too. We've got to get away from this race stuff. It turned out they were comfortable where they were and they liked their little privacy, they liked their little room, they liked their little box, they liked that nobody had to deal with them. And then I got the complaint over in the dormitory that they didn't like being with those other people because they just felt like they wanted their privacy. So it taught me a lot about humans, just that little dormitory. A: It wasn't trouble, it wasn't trouble. It was that they liked it, they got used to it and they liked it. Q: They're more comfortable in the cell than they are in the dorm. A: Well, in prison it's privacy. How do you like to go to the bathroom with 10 other people maybe at the same time and you're sitting right beside them, versus having your own private little bathroom, your private little toilet…Now where would you really rather be?